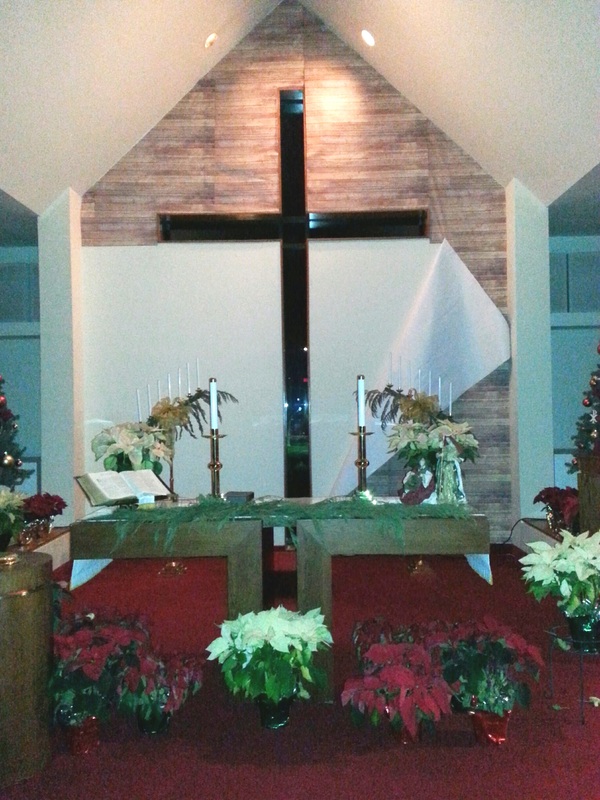 I walked into the sanctuary yesterday to this scene, and with a sigh I realized, Christmas is over. The paper is literally peeling off the walls! The magical season of twinkling lights and silent nights is being replaced by the flurry of activity that greets us with the new year. A piece of me desires to stay fixed on Christmas, but I know I cannot. There is a great story in the scriptures called the Transfiguration of Jesus. The story appears in several of the Gospels, including Mark 9:2-12, where Christ takes some of His disciples up to the top of a mountain, and they catch a little glimpse of Christ’s Godhood. The disciple Peter’s response is one I might have given as well. “Hey, this is great! Let’s pitch some tents and stay here!” We’ve all had those mountaintop experiences, whether spiritual, emotional, physical or a combination of these. The exhilaration, the excitement, the adrenaline rush – these are good feelings we want to hang on to. Jesus doesn’t let His disciples stay on the mountaintop, however, just as He doesn’t let us get stuck at Christmas. There is work to be done in the valley. In Christ’s case, He turned His gaze toward Jerusalem, and His coming crucifixion on our behalf. For us, there is also much work to be done in the valley – God’s work – the work of building God’s kingdom. As you read through this WIRE, you will see that Grace Ministry is preparing to feed 75 to 100 families tomorrow. Backpack Buddies is getting ready to pack 150 backpacks with food for hungry children. Mission trip applications are out, and trip planning is underway. The Amigos are launching a new ESL class (volunteer leaders needed). Sunday school, youth group, Bible studies, music ministries and more are back in full swing. The building project planning is moving forward. And these examples just barely scratch the surface. Where would God have you serve? All this is not to say that we just need to be busy. Busyness without purpose has little value. The scripture is very clear on this. God responds to Peter, saying “This is my Son, whom I love. Listen to Him!” I love the exclamation point at the end. God is not kidding here. If our work is to have meaning, we must first get on our knees and discern God’s purposes and desires for us. We must listen to Jesus. Then we must go and do, knowing He walks beside us in the doing.